Purchase any of our PRO BULK packages, starting at just $60 for one month and get our 60-page wagering guide as a FREE GIFT. This guide will help you understand our handicapping method as well as provide multiple visual examples of how to use our tipsheets and play our picks. You shouldn’t have to pay for lousy tips. If you are ever dissatisfied with our tips or service, simply request a refund from the MY ACCOUNT page and you will receive 100% of the purchase price of the tipsheet with no questions asked. Does not apply to bulk purchases. Contact us anytime at tips@guaranteedtipsheet.com. Our tipsheets are available in various forms, however we do not sell individual tracks. You may purchase any one race date and receive all available tracks for that date. The price for our standard one day service is $15.00 a. We also offer a BEST BETS package for $10.00 which includes 3 picks per track for any one race date. We also offer our tipsheets in bulk starting at $45 for a month which includes all tracks and all dates. More details can be found on our DOWNLOAD PAGE after you create an account and log in. Forgot your username or password? Click HERE to have your login and password emailed to you or reset. Our tip sheets are presented in plain text format for easy reading and printing. You may view a sample tip sheet here. Tipsheets may also be accessed from our mobile apps. Our tip sheets are sold in DAILY BUNDLES. Pay $15 and you will gain access to ALL TRACKS for the day you choose. After purchasing, simply go to the DOWNLOAD TIP SHEETS page to view the sheets for the date(s) you have purchased. TIP SHEETS ARE NOT EMAILED AFTER PURCHASE, THEY ARE ONLY AVAILABLE ON THE DOWNLOAD PAGE OR VIA OUR MOBILE APP. Our tip sheets contain up to 6 picks (with EXA/TRI recommendations) for each race which can be used in the event that one or more of our top 4 selections are scratched. These alternate picks may also be used in advanced wagering strategies for those that like to play more than 4 selections per race. Tipsheets will also be updated LIVE throughout the day to show late scratches along with their replacement picks if available. Jockey changes and track condition will also be updated live throughout the day (approximately every 5 minutes). Visit our DOWNLOAD page for the live updates. Please note that not all races will have 6 picks, we will only include them if we believe the alternate picks are of a higher rating than the remaining horses in the race. Tipsheets also list the day's BEST BETS at each track. These picks are what we feel are the strongest of the day based on morning line conditions and are recommend for all exotic and W/P/S plays for that race. Our daily best bets are what we feel are the strongest of the day based on morning line conditions and are recommend for all exotic and W/P/S plays for that race. We feature 3 best bets per track, per day. These best bets are a part of all tipsheet purchases or can be purchased separately for $10 per day from our download page. Each best bet also includes our top 6 picks for the race in which the best bet is running. You can view a sample of our BEST BETS here. Each day we offer our entire tipsheet for ONE TRACK (chosen at random). This track is marked as FREE on our homepage and download page. We also offer free picks for all tracks running on our FREE PICKS page. Our tip sheets provide our TOP 4 PICKS for each race along with our recommendations for EXACTA and TRIFECTA wagering. Please note that our EXA+TRI picks are based on the morning line odds and other factors and are made days in advance. Our picks are made with the anticipation that the dirt track will be FAST and the turf course FIRM. We strongly recommend placing additional or alternate wagers using combinations of our top 4 picks based on current track conditions, live odds, late scratches, jockey changes, weight changes, etc. We do NOT recommend placing every single type of wager on every race or simply boxing all 4 horses. While these types of wagers can and will produce winners, you will win less money over time. The best thing would be to create more individualized wagers that have the best chance to produce decent payouts. For example, don't box 4 horses where 3 of the horses have odds of 3-1 or less. The only real way you win is if the fourth horse comes in with one of the lower odds horses. Otherwise you'll spend $48 and may only get $30-$40 in return. A better play would be to create several 2 horse boxes so that you spend less and get a larger payout if you do win. While you may not always win in this type of scenario, it is the better play and will produce more profits in the long run. Remember to always bet within your comfort zone. 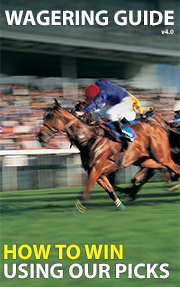 Just because you don't live close to a live racetrack doesn't mean that you can't still enjoy and wager on the races. Sites like TwinSpires allow people from many states to register and place wagers on most simulcast tracks around the country. A complete history of our results can be viewed from our PAST RESULTS page. You will see our tip sheets as they were originally printed along with results overlayed. You can drill down to specific dates if desired. Please note that all results posted are based on $2 hypothetical wagers but do not factor in the cost of any wagers or losses. The reason for this is that we don't recommend placing every possible wager on every race and we don't pretend to know what wagers were placed by various users of our sheets as a multitude of different wagers can produce the same payout, all at different levels of investment. We simply post all POSSIBLE payouts using combinations of our top 4 picks (alternates 5 and 6 are only used in the event that one or more of our top 4 are scratched). Results inlcude W/P/S, EXA/TRI/SUPR, Daily Double, Pick 3, Pick 4, Pick 5 and Pick 6 wagering. The way our results are calculated and posted is the norm for tip sheet providers. However, be wary of some online handicappers as they will claim daily wins of $54,000 superfectas, $7,000 trifectas, etc. A closer examination of these wins show that the horses that came in 1st, 2nd, 3rd and 4th were actually picked 1st, 7th, 8th and 9th on their sheets so they claim to have *KEYED* the win. ANY ONE HORSE CAN KEY A WINNING SUPERFECTA if you wager enough money. In the example shown, you would have needed to wager close to $4,000 per race to win that payout. They don't tell you that part and hope to just pull you in with some "BIG 'UNS" scattered throughout the site. Be smart and look at the full race details. Don't fall for these scammers. Our sheets have 4 horses selected for each race and we ONLY claim a win if all four of those horses produced the result. We do not post or take credit for *KEY* payouts. Results are entered automatically via an XML feed provided by a third party. Every effort is made to ensure their accuracy, but errors may occur. If you see a possible error in our result tabulation, please contact tips@guaranteedtipsheet.com to have it manually reviewed and corrected if necessary. We currently support payments through PayPal’s trusted servers on our website. You may use your CREDIT CARD, DEBIT CARD, PAYPAL ACCOUNT or other payment methods as supported in your country. Payments are secure and processed instantly. You will be able to access tip sheets immediately after payment is made. WE DO NOT STORE ANY OF YOUR PAYMENT OR FINANCIAL INFORMATION ON OUR WEBSITE. All payments are made MANUALLY. We do not automatically charge you for anything, EVER. Note that payments may also be made via our mobile apps. We offer bulk payments for those that wish to buy ONE MONTH or more at a time. These bulk payments offer a substantial discount over our individual date picing. REFUNDS ARE NOT OFFERED ON BULK PAYMENTS. Bulk payments begin on the purchase date and the expiration date can be seen on the ACCOUNT page when logged in. We also offer a single LIFETIME payment option which will never require you to purchase another tip sheet from us. If not satisfied with your tip sheet purchase, you have 3 days in which to request a full refund. Simply login and click the ACCOUNT page. Choose the payment and click REQUEST REFUND. Refunds are processed manually, typically within 3-10 days. Users found to be abusing or taking advantage of the refund policy will have their accounts permanently disabled. Please note that our refund policy only covers the cost of the TIP SHEET, not any wagers made. Please bet responsibly and within your comfort zone. Our sheets and results are produced in part by using statistical and historical information purchased and/or made freely available by Brisnet.com, DRF.com, Twinspires.com and Equibase.com. This may include past performances, speed index ratings, trainer, owner and jockey statistics, scratches and changes along with results and payouts. This information is taken into consideration and then each race is indivudally handicapped by a real person. Our sheets are not generated by a computer or application. All data is entered by hand and sometimes mistakes are made. Any duplication of content between our site and those providing our statistical and historical information is not intentional, but may occur due to the very nature of the content being provided. Results are entered automatically via a third-party XML feed. All results may be manually verified via Equibase.com.